At West Brattleboro Pizza we study the science of making the perfect pizza. A Pizza must have a solid foundation, so let's talk about the crust. We make our own dough daily, in small batches to ensure freshness. We have to plan ahead because we let our dough rise to give our crust depth without heaviness. We use only the freshest flour, sugars, salts, and virgin oils available. Our dough mixer is only a few feet from where it will be baked to perfection in our brick slab oven. This is what makes it possible for us to deliver "the best taste in pizza". We Delivery to Brattleboro. Guilford, Vernon, North Hinsdale, Marlboro, West Chesterfield, Dummerston, and Putney. We Deliver in Rain, Snow, Sleet and now hurricanes. Call now for fast delivery! Darci, Matt and Shay are ready to deliver your food. They are commited to delivering your food hot and fast. Surprise your loved one with a delivery at work from you. 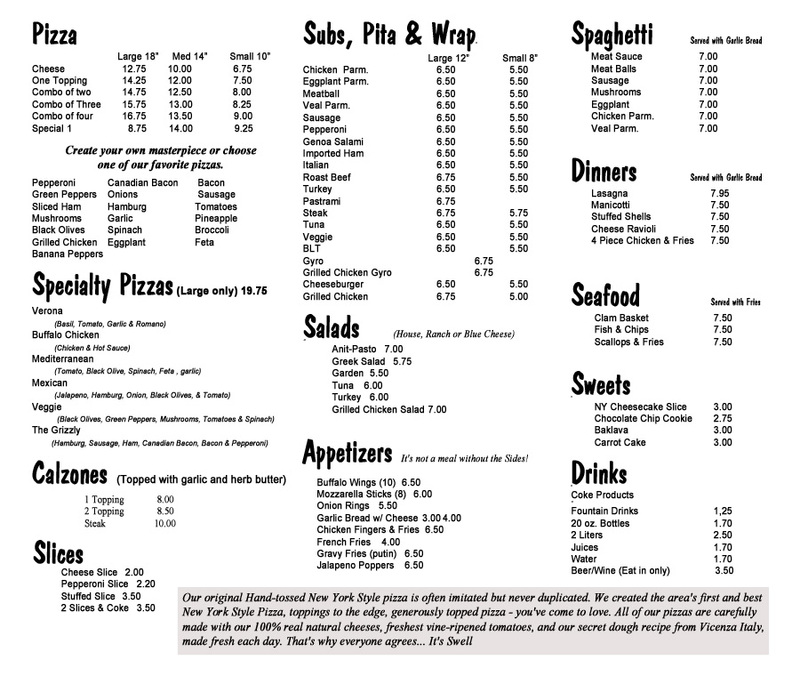 If you get delivery, why not for an extra menu for your neighbor. Not everyone knows we deliver! Stop in and relax from your busy schedule. We have TV s for you to watch the news or to catch up on the game. From birthdays to a wedding or just taking the family out for a treat. This is the place. Meg, Adam, Joycelyn, Kristin, Lori are working side by side to provide their customers with the finest quality ingredients, combined with a warm and friendly smile. It's always a great night for pizza. Pick up a piping hot pizza and visit alittle with us while you wait. Grab a pizza and wings on your way home.Call ahead for faster pick up! Call us if you are planning a party, wedding, project or businss meeting. We offer the competitive prices without lowering qualtiy.